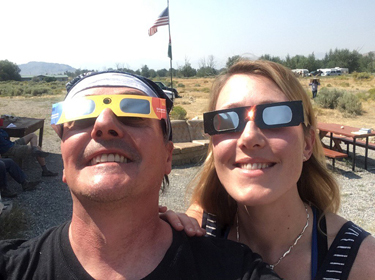 SciCom lecturer Peter Aldhous and KQED science news editor Danielle Venton '11 watched the eclipse with scientists at Lost River, Idaho. Photo courtesy of Danielle Venton. From NASA TV to KQED radio to the pages of The New York Times, graduates of the Science Communication Program played a major role in conveying the scientific and societal impacts of the August 21 solar eclipse to eager readers. Their reports spanned every medium, from print and broadcast to slideshows and social media, and every time zone in the country. SciCom graduates worked as editors of national coverage, on-location hosts, and authors of explanatory and public-service pieces. The alumni also hailed from each of the program’s four decades, from its founding in 1981 to several members of the latest graduating class. Extensive coverage in The New York Times featured the work of science writers Nicholas St. Fleur ’14 and Kenneth Chang ’95. 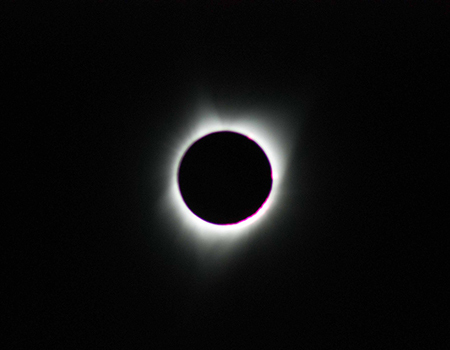 “On the Path of Totality” (August 22) by Helen Fields ’03, freelance writer in Washington D.C.